Did you ever play Steampunk Tower Defense game? 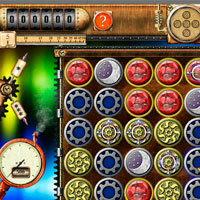 Well here in Steam Z Reactor it is a match 3 puzzle game that is based on Steampunk TD. Your mission is to assemble the figures as shown in the image into groups of 3 or more by clicking and dragging them to assemble them. You'll get points for doing and when you destroy gems. Destroy the gems quickly to get your score multiplied. Follow the in game walkthrough tutorial if that doesnt make sense. The way the tiles move on the game board is a bit different. I hope once you get used to how it works it is fun and addictive for you.